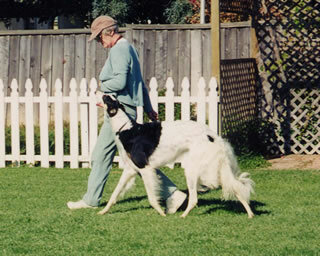 The first borzoi in many years to hold an AKC tracking title and the first borzoi ever to hold the new AKC title of Versatile Companion Dog. Belle and her photo are displayed on the AKC Versatile Companion Dog web site. 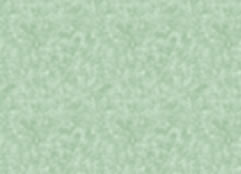 Go to Versatile Companion Dog, January, 03. 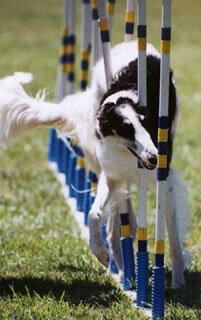 Belle completed her CD in 3 Trials with two High in Trials. 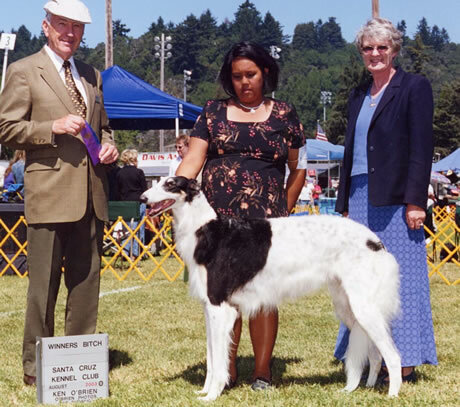 She was the Borzoi Club of America Obedience Trophy Winner for the year 2000. 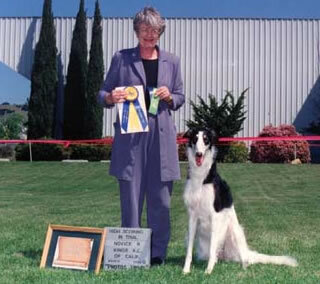 She also won the Monterey Bay Dog Training Club Trophy for completing her title in three Trials with an average score of 195. Tracking. In training for her TDX. Belle is very food motivated. Loves to eat cookies and is always the first one at the door to get in the van and go for an adventure with me. Shes a happy go lucky girl with a big smile and my most favorite dog ever.